The core philosophy of ArtStation is that it should be your central portfolio, and be able to publish to variety of other social networks easily. 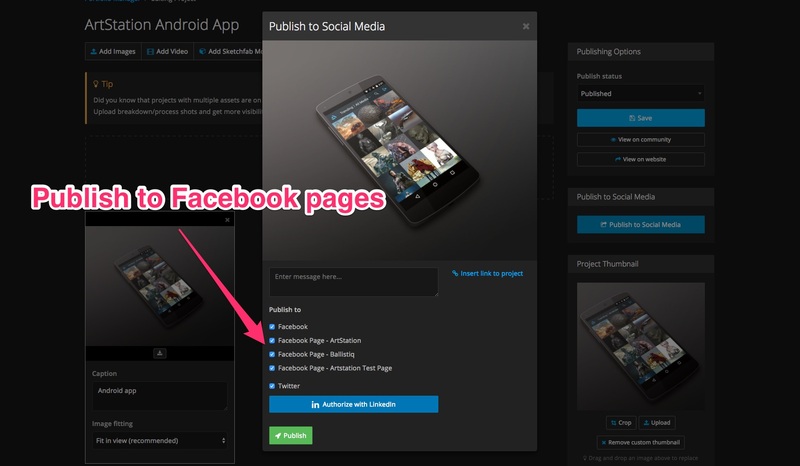 We already built in the ability to publish your work to Facebook (personal timeline), Twitter and LinkedIn. Today we have launched a new feature just for Pro members – the ability to publish to your Facebook pages! When publishing a new artwork, a dialog will show up asking where you would like to publish to. As a Pro member, you’ll see the list of pages that you can publish to. You can publish to multiple pages as well as your personal profile, plus Twitter and LInkedIn all at once. Facebook’s personal profiles have limitations. For example, there’s a limit on the number of friends you can have, etc. Facebook Pages are a way for you to set up a more serious business presence on the social network. Many artists have a personal account and a page for their art. ArtStation supports both now – so you can share to both your personal profile as well as pages that you manage.